It's been 13 long years since Honda did any major redesigning of its stair-stumblin' Asimo robot. Now, they're about ready to unveil P4, the fourth version of Asimo. Update: It turns out the P4 is just a new, old Asimo. As our friend Tim explains, the Asimo P4 isn't an updated version of Honda's robot. 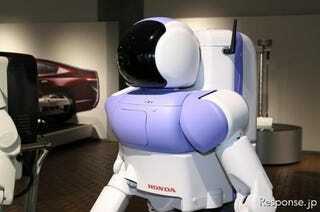 Rather, it's a prototype for the first Asimo that was unveiled in 2000. It was shown off in Japan at that time but, as PlasticPals mentions, went largely undocumented until now. The successor to the original Asimo was the New Asimo, which was released in 2005. So the blue-breasted P4 isn't an Asimo that will be; it's an Asimo that almost was. P4 looks a bit more lithe than the P3, although it's still definitely a big clunky robot that I wouldn't expect to be able to beat anybody in a fast walking contest. But with 34 joints and a more flexible waist, it's supposed to be able to dance better than ever before. And if a robot can't dance, what good is it?